View cart “Week 5 – June 2nd 2018 – Kundalini Yoga Course – $25” has been added to your cart. 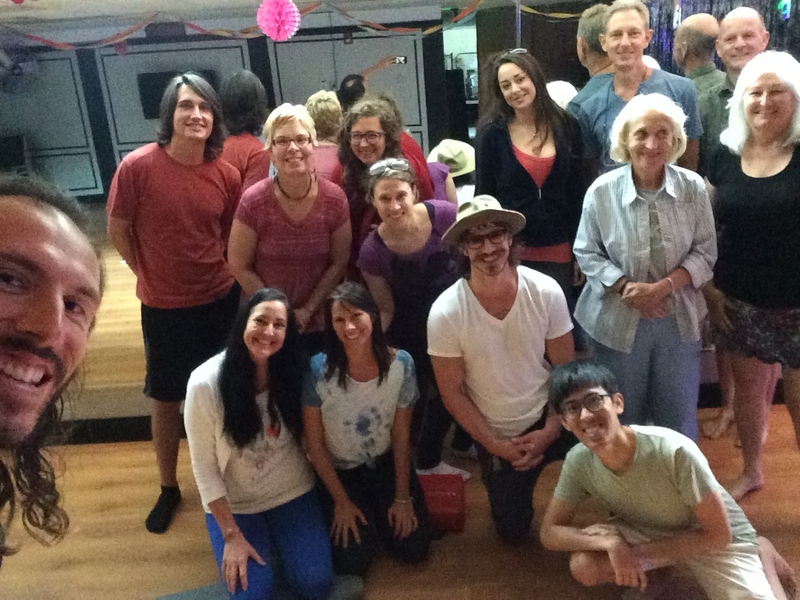 Our 6-week sound energy healing series was a great success! 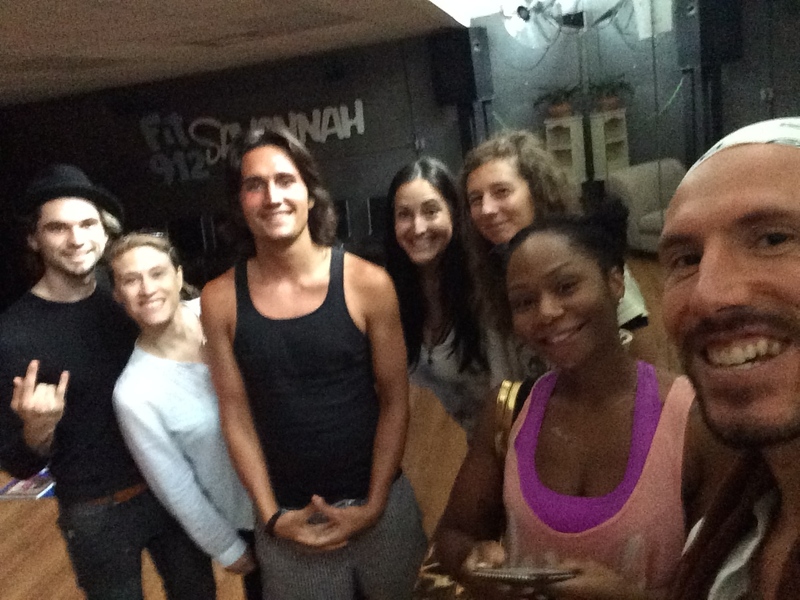 Here are some photos from the classes. What a great group, so proud and happy to have shared! 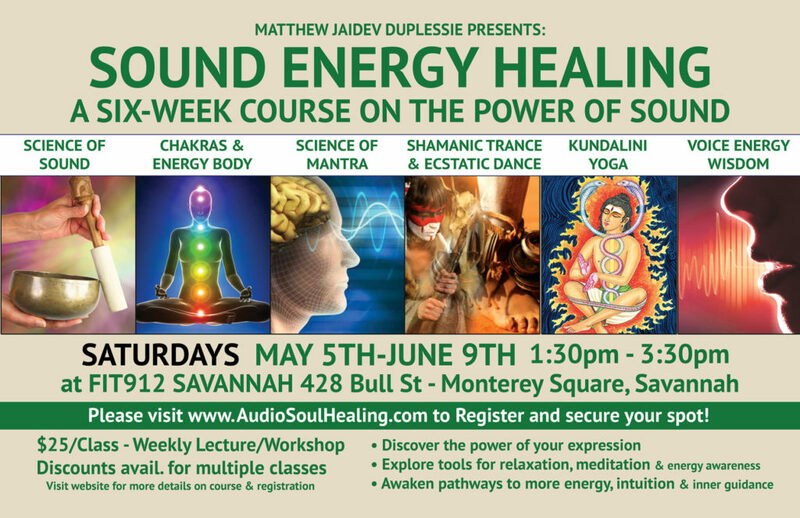 Join Savannah, GA sound healer and kundalini yogi Matthew Jaidev Duplessie in a 6-week series exploring the healing power of sound as explored in various scientific and spiritual traditions. This series will take place on Saturdays from 1:30pm-3:30pm, May 5th-June 9th at Fit912 Savannah in Monterey Square downtown Savannah. 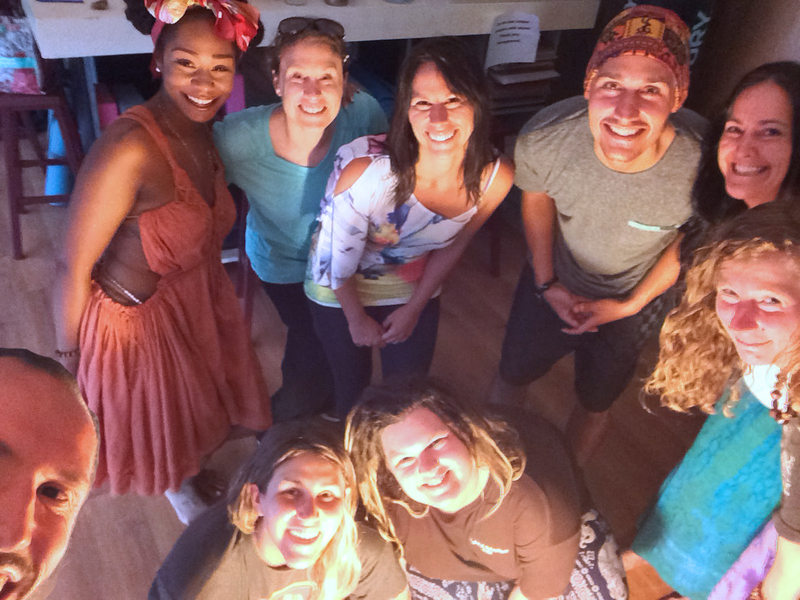 Weekly courses include the science of sound healing, intro to chakras & energy body, the science of mantra, shamanic trance & ecstatic dance, kundalini yoga and voice energy wisdom. Please see below for registration details, location information, weekly class schedule and format, payment details and what participants can expect to receive through attending the course! 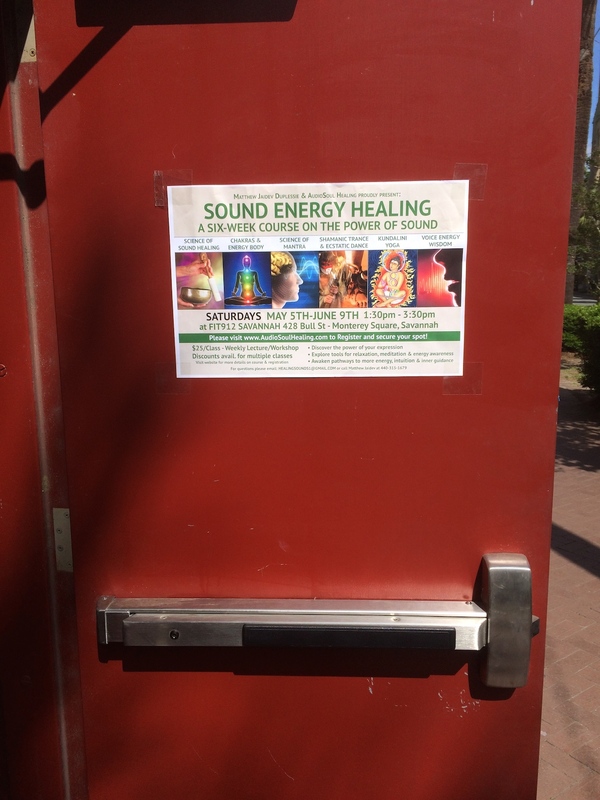 To register for the 6-week Sound Energy Healing Lecture/Workshop course, there are two options. Sign up for 5 classes and get my Relax and Energize albums for free! Sign up for the entire course and get all of the above plus one free class! 2- Sign up for individual courses. Please click on the “Add to Cart” button below for each of the individual courses you would like to attend. After you Add all the courses you would like to attend to your Cart, please visit your Shopping Cart and fill out your registration details at checkout. Thank you so much for your interest, I look very much forward to sharing this knowledge with you all! Lecture/Talk: “SOUND IS ENERGY”. 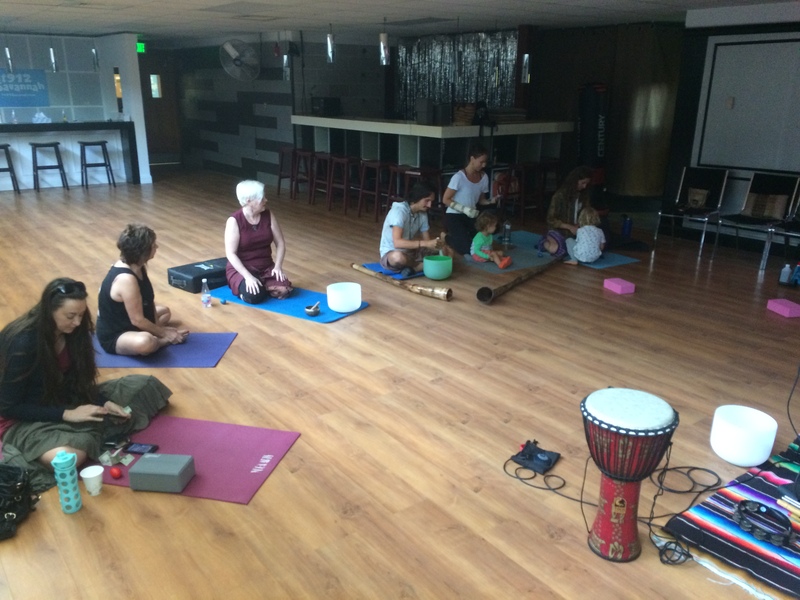 Learn about the power of sound, frequency and vibration as a form of energy that can be used for healing, balancing, energizing and relaxing our human body, mind and spirit. 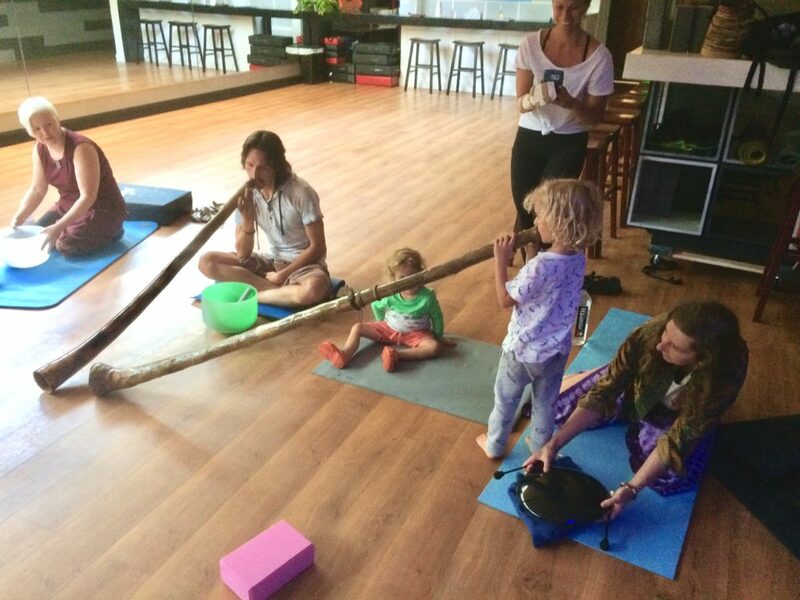 Workshop/Experience: LIVE SOUND HEALING JOURNEY After the talk instructor Matthew Jaidev will guide participants through a one hour sacred sound journey experience as he consciously layers loops of voices, drums, stringed instruments and world sounds to transport participants to spaces of intention through sound and vibration. Suggested to bring: A yoga mat for the sound journey, bottled water, journal/pen for notes. Cost: $25.00 for 2 hour lecture/workshop. 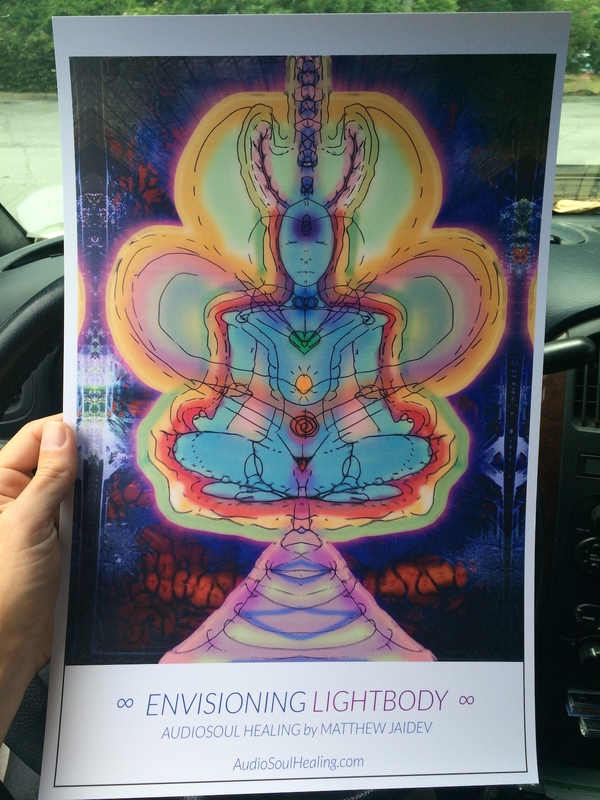 Lecture/Talk: “OUR BODY’S ARE COMPRISED OF VARIOUS ENERGIES CALLED CHAKRAS”. 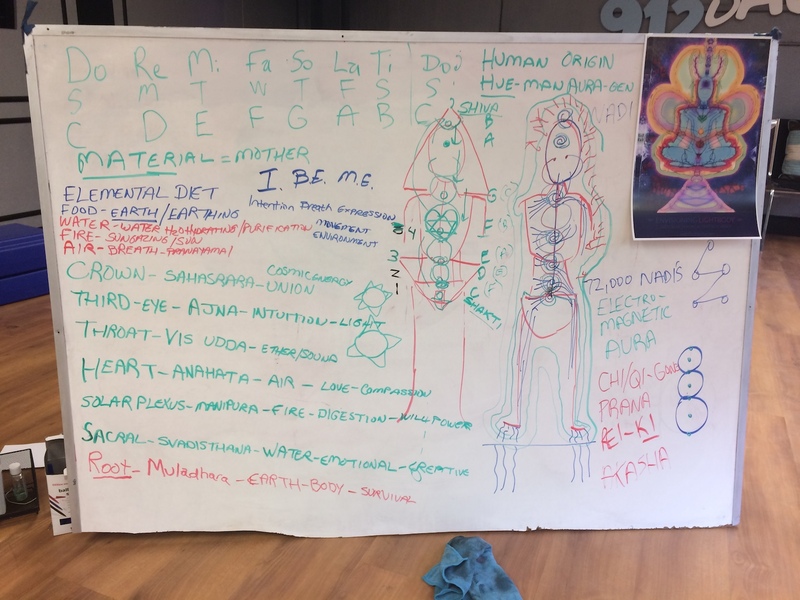 In this lecture, there will be an introduction to the human energy body, composed of chakras, “spinning wheels of energy” that relate to different facets of our consciousness, needs, and physical organs inside the body. 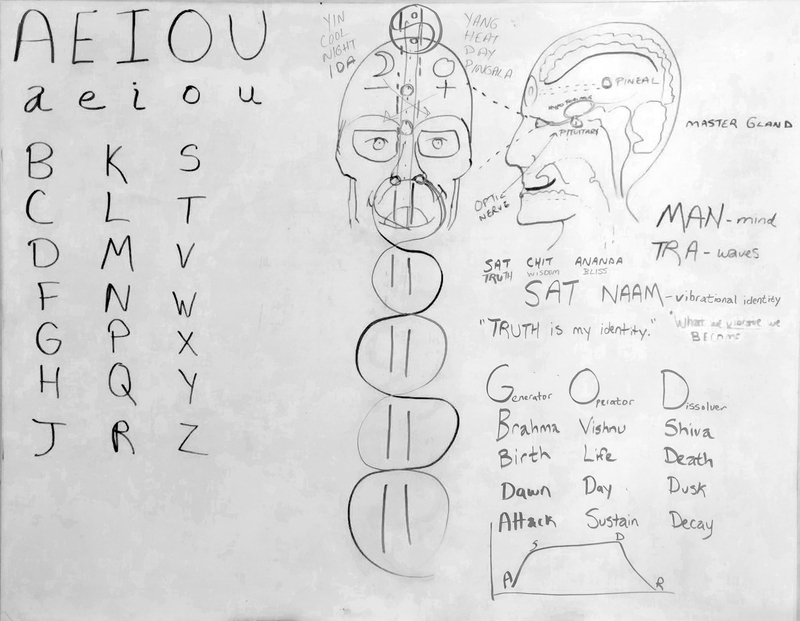 Also learn about Matthew Jaidev’s Elemental Diet and his I.B.E.M.E. 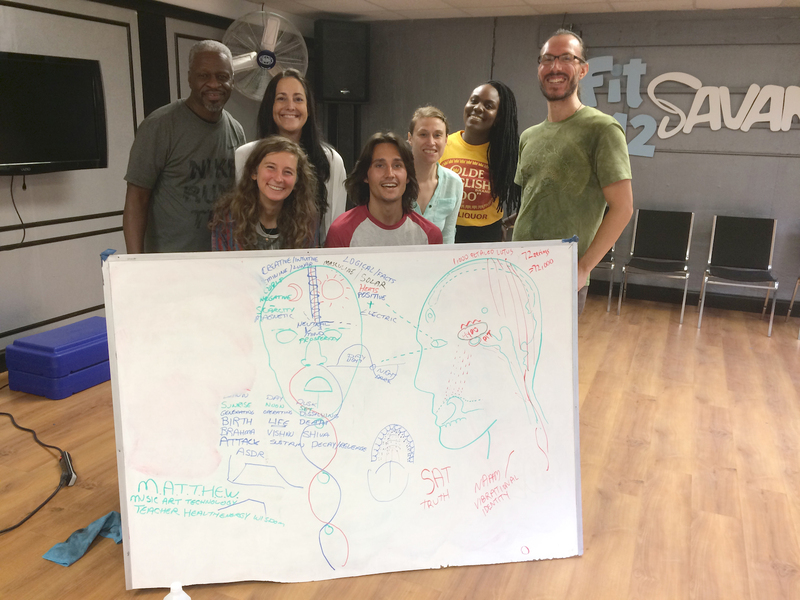 (Intention, Breath, Expression, Movement, Environment) philosophies to help reconnect yourself to sources of energy that nourish us on multi-dimensional levels. 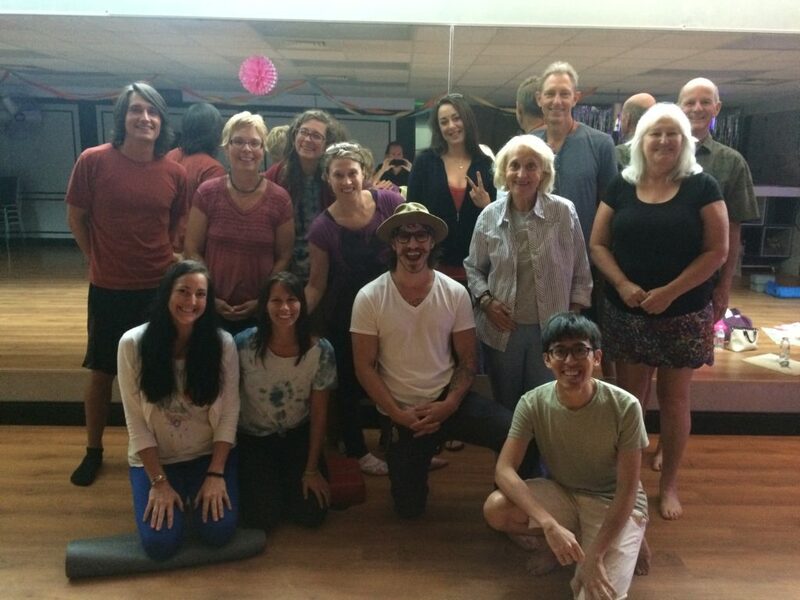 Workshop/Experience: Qigong Instructor – Clayton Crosley will guide us through an hour-long QiGong awareness with toning the Sounds of our Emotions/Organs. Suggested to bring: Wear loose/relaxing clothing for QiGong experience, bottled water, journal/pen for notes. Lecture/Talk: “SCIENCE OF MANTRA CHANTING – USING OUR VOICES TO SHIFT OUR CONSCIOUSNESS”. Man means mind and tra means waves. In this lecture, Matthew Jaidev explains the Science of Mantra, and how chanting can be used to help soothe the waves of the mind. Learn about the polarizing thoughts between our Positive and Negative minds, and how chanting helps align us with our Neutral minds to become more relaxed. Discover how chanting affects our physiology and consciousness, and uncover the hidden mantra encoded in your very own name! 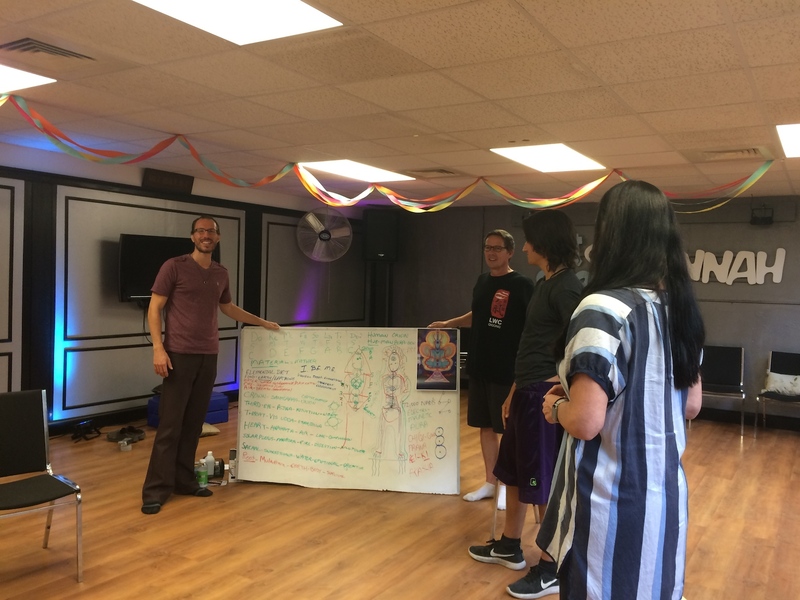 Workshop/Experience: We will be exploring various chants from around the world, exploring the fundamentals of language, through a consonant/vowel chanting workshop and everyone will leave with a new perception of themselves as a personal mantra is discovered encoded in each of our names since our birth! Suggested to bring: Bottled water, journal/pen for taking notes. Lecture/Talk: TRANCE – “OUR ANCESTORS USED SOUND AND VIBRATION TO ACCESS DIFFERENT STATES OF CONSCIOUSNESS”. Many indiginous, tribal and Eastern cultures have found connection to Nature, the Universe and their individual spirit by evoking different states of consciousness. These are typically known as trance states, and are the connection to our inner world where ancestral wisdom, guidance and healing can be found dwelling within our very own bodies, minds and consciousness. Workshop/Experience: There will be two experiences to induce trance. One, inspired by anthropologist’s Felicitas Goodman and Belinda Gore’s study into trance postures, Matthew Jaidev will be guiding participants into a series of short 15-minute states of trance while assuming various held postures reasearched by these anthropologists, using drum, rattle and voice. 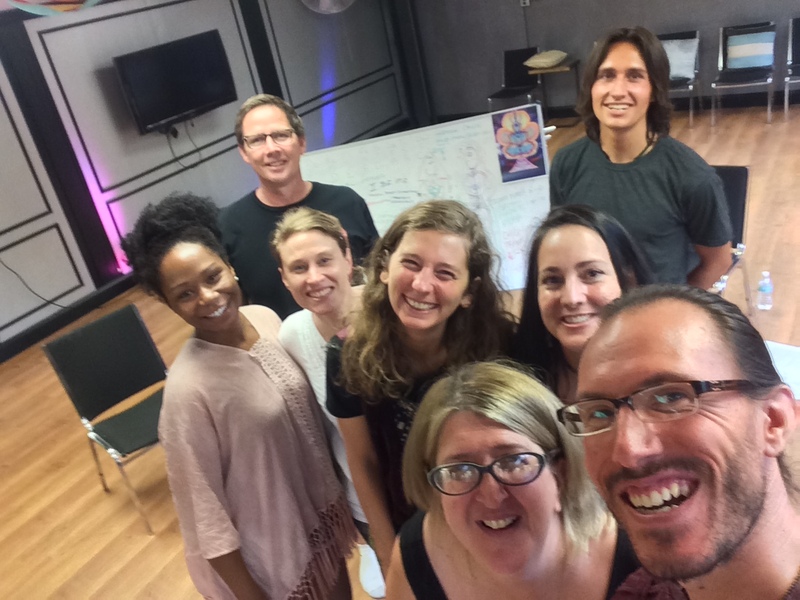 Afterwards Ecstatic Dance instructor Jess Trevitt will guide participants into an Ecstatic Dance experience fueled by Matthew Jaidev’s live soundscape creations. 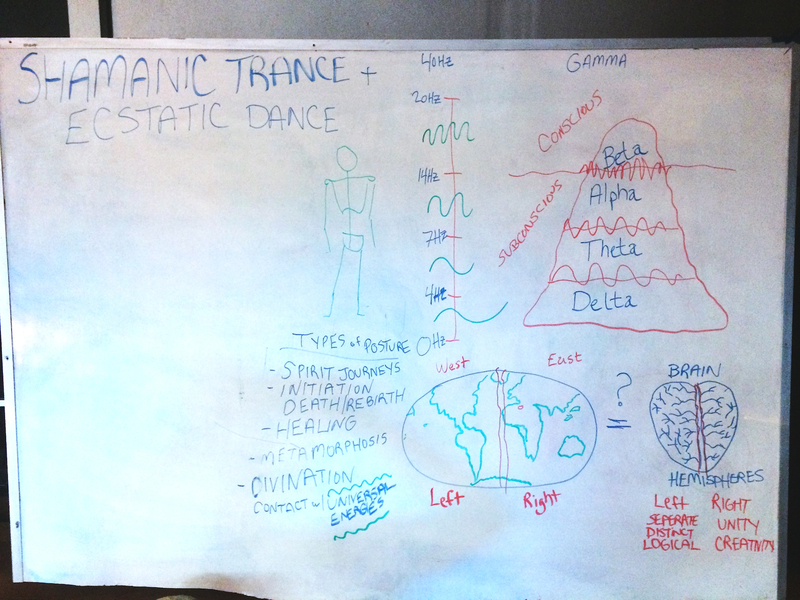 Suggested to bring: Wear loose/relaxing clothing for trance/dancing experience, bottled water, journal/pen for notes. 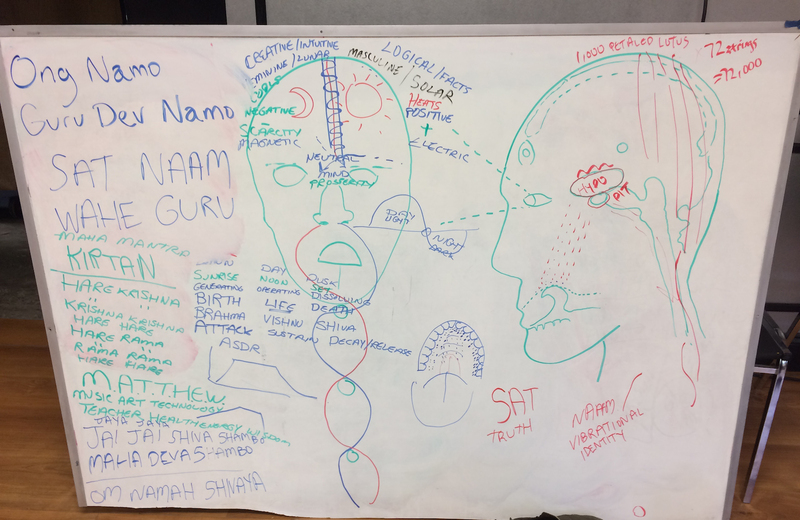 Lecture/Talk: Kundalini Yoga is the science of reconnecting the technology of the body to our own personal guru (that which brings light to the darkness, wisdom to ignorance.) Learn about the various facets of our own Kundalini energy, while discovering the multi-faceted aspects to a kundalini yoga class such as kriya postures, meditation, pranayama breath and chanting. 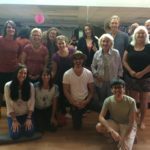 Workshop/Experience: Matthew Jaidev has been trained as a certified Kundalini Yoga Instructor in New Mexico under the teachings of Yogi Bhajan. In this one hour class, participants will experience what a typical kundalini yoga session is like, exploring the many facets of the mentioned kriya postures, pranayama breathing techniques, meditations and chants. Suggested to bring: Wear loose/relaxing clothing for kundalini class, bottled water, journal/pen for notes. Lecture/Talk: “Voice as a Healing Instrument”. 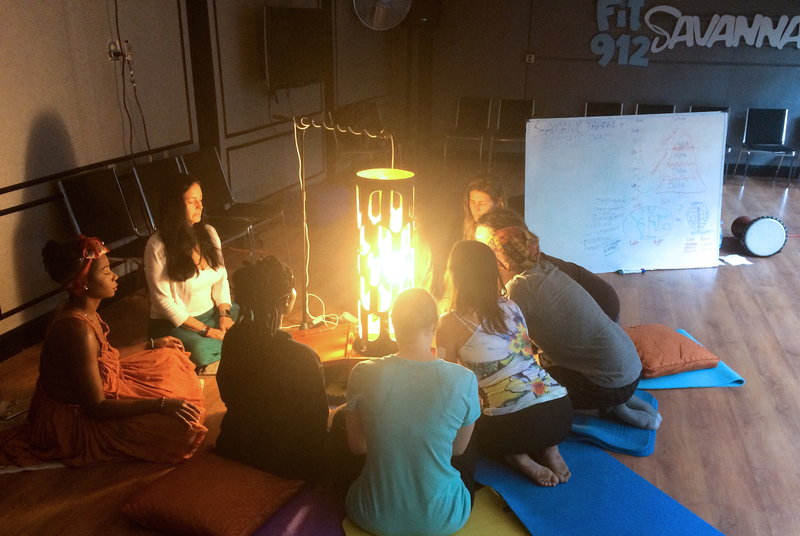 In this last day of our workshop series, after being guided through all the fundamentals of sound, consciousness and healing modalities related to sound healing, participants can expect to discover that within themselves lies the keys to their own healing and inner answers can be discovered through the power of our expression. Learn about the power of our words/thoughts and see how we can energize ourselves and one another through discovering our own inner Voice Energy Wisdom by expressing our truth! Workshop/Experience: There will be two experiences. 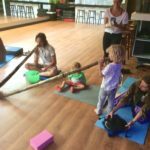 One will be led by Matthew Jaidev into intuitive toning experiences to allow ourselves an opportunity to make spontaneous, free expressive sound through removing inner blocks of resistance, tension and self-judgment. The second portion will be led by Vibrational Alchemist and Energy Healer Myrrh De Marmion as she guides particants into an experience of personal voice discovery called Accessing Your Sacred Voice. Suggested to bring: Bottled water, journal/pen for taking notes, an item from nature that speaks to you as this will help in the vocal toning exploration. Each two-hour weekly workshop class costs $25.00. Register before April 30th, 2018 and receive one class for free! 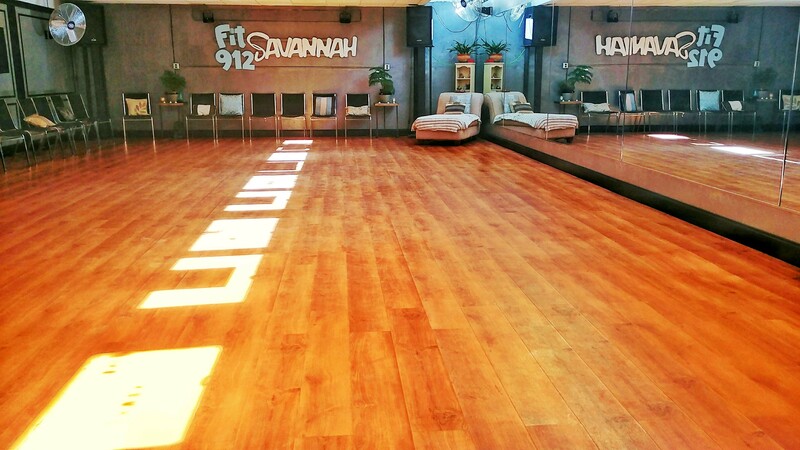 All workshops can be paid through registration through the above Add to Cart links above, or in person to Matthew Jaidev Duplessie through cash or credit/debit card in person at Fit912Savannah the day(s) of the workshop. Note: If you must cancel your reservation prior to class, a non-refundable portion of $10 per each class registered will not be returned in order to secure rental costs and materials in preparing and planning the course. The remaining portion will be returned to you if you cannot attend. 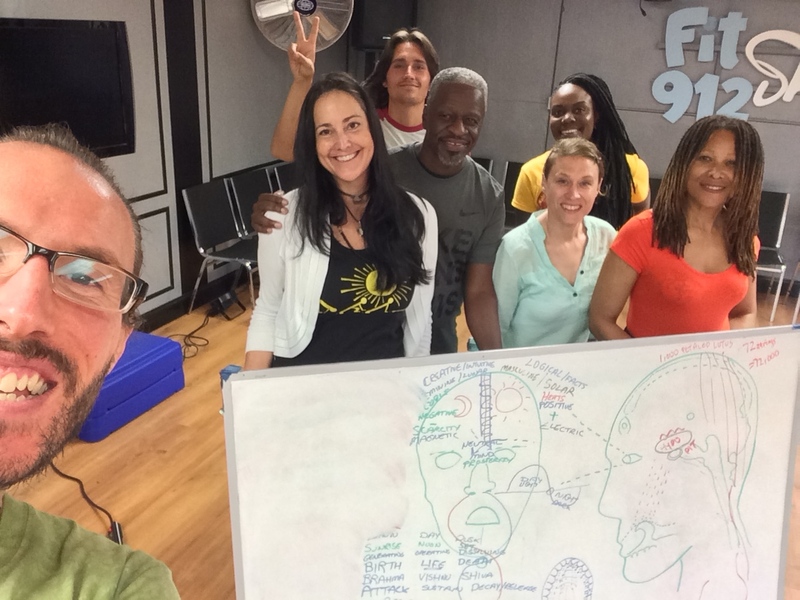 • Topics ranging from the Science of Mantra, Intro to Kundalini Yoga, Shamanic Trance & Ecstatic Dance, Voice Energy Wisdom, Science of Sound Healing, Energy/Chakras and more! • Discover the power of your expression and your own voice! • Explore tools for relaxation, meditation! • Awaken pathways to more energy, intuition and guidance! • Transform your life by becoming more open, aligned and tuned in to the healing power of sound! If you have any questions or would like more information please email Matthew Jaidev at healingsounds1@gmail.com or text/call 440-315-1679. Thank you!